Yesterday I was able to check out an "Asian cuisine" restaurant in the International District, Red Lantern. We got food to-go and took it home for lunch. (I'm excited to come back in the evening as the dinner menu is more extensive and several dishes caught my eye). 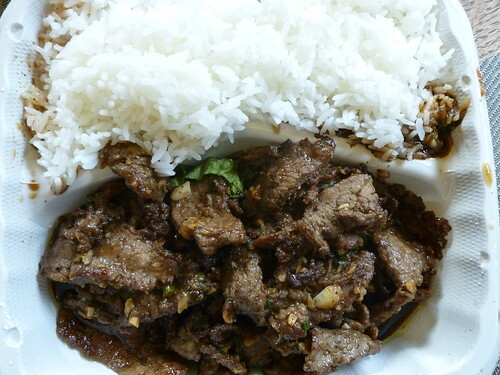 We enjoyed the garlic and peppercorn beef, the sesame chicken, and the mixed vegetables. Apart from the yummy food, the highlight of this restaurant is the value (each entree/appetizer dish comes with rice and soup and portions are generous). Service is also friendly- since we were getting food to-go, we were given our roasted corn tea (which comes with lunch) while we were waiting for the food. Delicious! The owner even showed us how they make it. I'll definitely be stopping back for more.